Some institutions worry about the potential liability of putting outside CDs on PACS, but access to prior exams improves patient care. Among the challenges involved with processing outside CDs is the question of how it affects an institution’s liability for medical errors. There are various ways that facilities handle viewing and storing outside CDs, and the question of potential liability is almost always part of the decision concerning how to handle such images. Some institutions refuse to load any outside CDs onto their PACS, while others will only load images if they produce their own report on the study. And some choose to load everything they receive directly onto their PACS. The different approaches underscore the lack of clarity on this issue. Some facilities say they won’t put CDs on their PACS because they worry about data integrity. Those that won’t load anything without issuing a report often cite the potential for missed diagnoses. Those that load everything typically believe access to prior exams trumps other concerns. But the 800-pound gorilla lurking is liability. The word strikes mortal fear into administrators everywhere, partly because defining liability is tricky business. Institutions that won’t put outside studies on their PACS opt for workstations dedicated to outside CDs. Laptops are frequently used for this purpose. One advantage of this approach is that it prevents viruses on the CDs from reaching the PACS. But the effect on an institution’s liability with regard to this process has not been determined. Another method of processing CDs is to issue a report for every outside study that’s imported into a PACS, whether the institution is reimbursed or not. This method may significantly increase radiologists’ workload, especially in high-volume centers, but there is some evidence that it improves patient care. An April 2010 study in Radiology by Zan and colleagues of the Johns Hopkins Medical Institutions found a 7.7% discrepancy rate between outside reports and those done by Johns Hopkins staff. It also found that the second opinions were correct 84% of the time. Whether the improvement in care translates to a reduction in liability is unknown. David M. Yousem, MD, MBA, corresponding author of the study, declined to be interviewed for this article. A process that many institutions are beginning to adopt is wholesale acceptance of loading outside CDs onto PACS. This is driven partially by decreasing storage costs and partially by workflow concerns, but there is also evidence that it improves patient care. A recently completed but as yet unpublished study by UCSF—Lu is the lead author—found that viewing outside images on PACS resulted in less repeat imaging than viewing outside images on laptops. 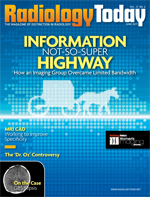 The effect of these findings on liability was not studied, but David Avrin, MD, PhD, a professor of clinical radiology and vice chairman of informatics at UCSF, believes the overriding issue relating to liability is access to prior images. In Avrin’s opinion, the issues of patient identification and image sharing are much more critical than liability concerns. But in the current malpractice environment, liability will likely be a major factor in shaping institutions’ policies. It seems, however, that the best liability protection for any institution would be to err on the side of patient care.